Last month saw the fewest sales in the market so far this year. Greater Vancouver's real estate market tanked in July as sales fell for the fourth straight month. But industry reps say the sales represent more "typical levels." 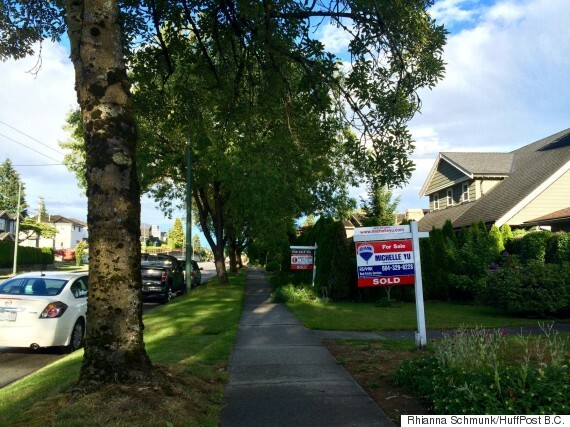 Greater Vancouver home sales fell by 18.9 per cent year-over-year in July, from 3,978 to 3,226. That also represented a fall of 26.7 per cent from June, when 4,400 homes were sold, according to stats released Wednesday by the Real Estate Board of Greater Vancouver (REBGV). It's normal for home sales to dip in the region at this time of year. But the dip came earlier in 2016. And July's drop was more dramatic than any in the past four years. REBGV president Dan Morrison said the sales data shows Vancouver could return to more "normal market trends" soon. But BMO senior economist Sal Guatieri said it's time to "let the cooldown begin" in a note published Wednesday. "While the pullback merely returned sales to more normal levels, it's unlikely to stop there," he wrote. July marked the fourth straight month that home sales fell in Greater Vancouver, a broad region that covers the cities of Vancouver, Richmond, Burnaby, Surrey and more. Sales fell by 7.7 per cent month-over-month in June, 0.3 per cent in May and 7.6 per cent in April. Prices, however, still haven't abated. 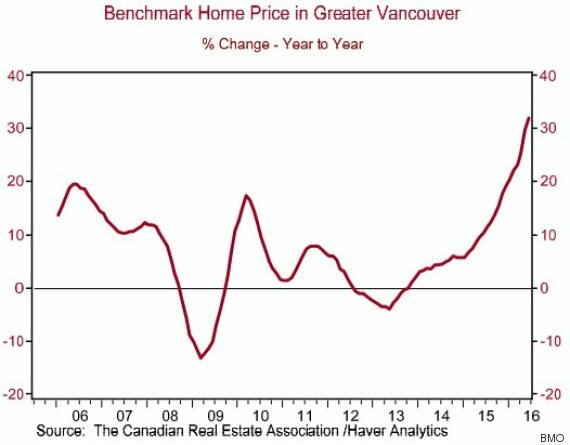 The benchmark price of a Greater Vancouver home hit $930,400 last month, up 1.4 per cent from June and up 32.6 per cent from the same month last year. Sales declines were particularly pronounced among detached and apartment properties in the City of Vancouver. 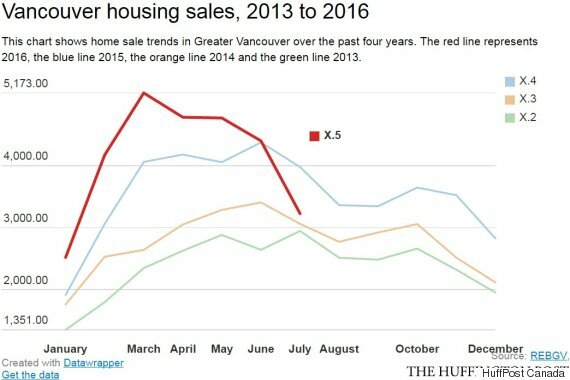 The chart above shows detached home sales falling for the third straight month on Vancouver's more affluent west side. The area saw 108 detached homes sold last month, marking the fewest sales of such properties since January 2015, when there were 100. This happened as detached listings remained steady, going from 328 in June to 317 in July. Apartment sales on the west side also saw a steep drop, going from 579 in June to 435 last month. Listings also remained steady for this type of housing. Similar trends were observed on the east side. Detached home sales fell for the second straight month on Vancouver's east side. The area saw 117 detached home sales last month, the fewest there have been since January, when there were 99 sales. These trends came amid a series of developments in B.C. real estate. Last week, the provincial government announced a 15-per-cent property transfer tax on foreign buyers, which would see them pay an extra $150,000 in taxes on a $1-million purchase, in an effort to cool housing prices. The tax triggered a flurry of activity before it came into effect on Tuesday. A record-setting 15,000 property transfer applications were filed with B.C. 's Land Title and Survey Authority (LTSA) on Thursday and Friday, crashing its electronic filing service in the process, The Vancouver Sun reported. But experts have said that the tax is unlikely to have a significant effect on housing affordability. But the sales trends also come as China cracks down on capital outflows — a factor that could have further effects on Vancouver housing, observers have said.